Mind over matter: is scarcity as much about psychology as it is economics? “Unlimited wants, scarce resources”. This is the economic problem. But once basic needs are met, how much should scarcity – having “enough” – be understood as a psychological problem? 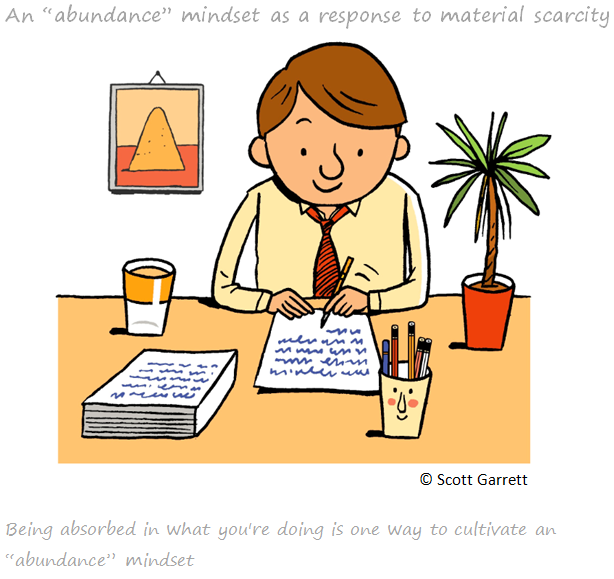 Is it possible to cultivate an “abundance mindset”? And what does all of this mean for how economics is taught? Over recent decades there’s been a step change in the use of ideas from psychology in economics research. The vast literature on behavioural economics, for example, has challenged the core assumptions of an entirely rational, self-interested account of human behaviour. Much, too, has been written on the economics of happiness and how we might improve on GDP per capita as a measure of progress. Even aside from research, the way we consume things (ie our economic activity) has become increasingly psychological over time: as basic needs are met with greater ease, the argument goes, we consume “ideas” (such as information in blogs) more than “stuff”. Far less has been written about the psychological aspect of scarcity. Yet this could have big implications, given the central role that scarcity plays in economic theory. Many economics textbooks define the subject as “the study of how society uses scarce resources” in a world in which we have “unlimited wants” (Samuelson & Nordhaus (2009); see also Mankiw (2015)). Scarcity, then, is arguably the central concept of economics, underpinning the existence of all markets. Not that this focus on scarcity is without its critics. Some have questioned whether excess makes more sense as the fundamental problem for social scientists to investigate. 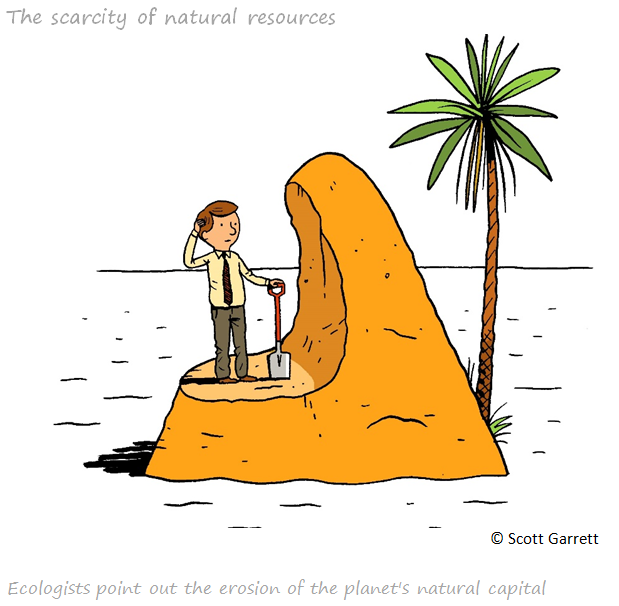 Many environmental economists, meanwhile, challenge how well capitalist economies (and mainstream economics) deal with the scarcity of the planet’s natural capital in the face of ecological degradation. When it comes to thinking about scarcity from a psychological angle, Mullainathan & Shafir (2013) note that if you are poor and struggling to make ends meet then you have no choice but to pay close attention to how you are going to pay for the next meal, bill or rent payment. Having to think carefully about money all the time acts like a tax on your brain – leaving you with less bandwidth to use for other purposes, such as learning new skills. This, they go on to argue, helps to explain why the poor stay poor. While they make a powerful point, they treat many inherently psychological things (like desires, preferences and utility) pretty much in line with standard economic theory – adding to this a psychological dimension to scarcity (albeit an important one). But I would argue that you could go further than this. Can we think of scarcity in entirely psychological terms? An economist might reason as follows. Individuals maximise their utility. Their desires are taken as given and their preferences are revealed by what they choose to consume. Resources are scarce, and this is why we cannot all have everything that we would like. From the perspective of psychology, however, you might get a pretty different account of what’s going on. Much has been written about the psychology of desires and what makes people happy – and one strand of this work is to take into account people’s subjective experience. My argument is that a similar approach can be taken to understanding scarcity: that scarcity – and hence the very core of “the economic problem” – at root relates to the question of whether or not we feel we have “enough”. My focus here is on what scarcity means in the context of people who have already achieved a certain level of affluence and whose basic needs have been met (and not, therefore, cases of poverty). Scarcity construed as a subjective sense of “not having enough” opens the door to an interesting possibility: that, at a psychological level, scarcity could be absent entirely. We could call this condition an “abundance” mindset. The question is then: what constitutes such a mindset and how might we attain it? The idea of something like an abundance mindset features in a number of spiritual perspectives. While little has been published in these terms in the academic literature, I think that findings from a few branches of psychology point to the possibility of an abundance mindset – even if they don’t call it that. And, crucially, they suggest that it’s something we can exercise some control over. One strand of the positive psychology literature links being “in the moment” to a sense of having enough. The concept of flow, for instance, is characterised by “complete absorption in what one does”. A professional basketball player who is completely in the zone, performing to the peak of his or her ability, would be an example of this. What’s interesting is that when you are so engrossed in what you’re doing, “other needs become negligible”. In other words, scarcity is absent. People who practise mindfulness offer another good example. As I argued in a previous post, there is evidence that more mindful people can cultivate a stronger sense of having “enough”, as a result of paying attention to the present moment and viewing the world less through the lens of desires and expectations. Other studies focus on how we choose to view ourselves and our environments. The main idea here can be traced back to Epictetus, who argued that what matters is not what happens to us, but how we interpret what happens. It is easy to see how this could be interpreted in terms of an abundance mindset. While testing this sort of existential theory is tricky, scientific studies do support the general idea. For instance, people with an optimistic outlook – something which can be learned – report higher well-being. Admittedly, a sense of scarcity may not be entirely absent if you view the glass as half full. But you would expect to be closer to having an abundance mindset here than if you always view the glass half empty. 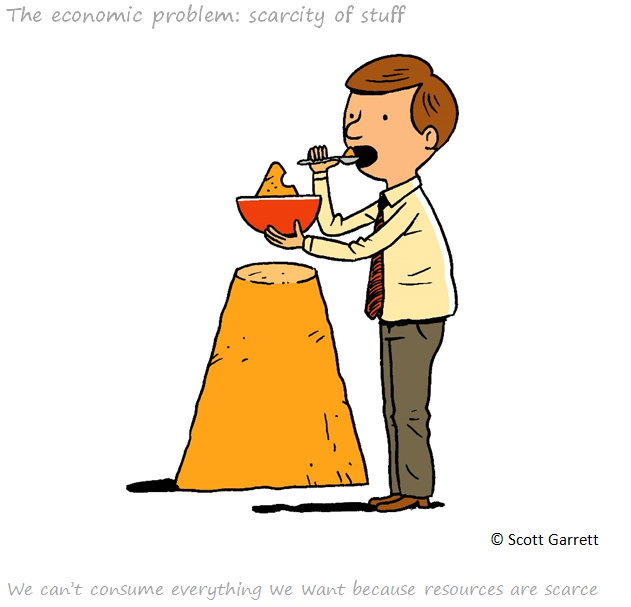 Does economics provide an adequate framework for studying scarcity? To answer this – and bearing in mind wider debates about rethinking economics and new frameworks for teaching it – consider the following thought experiment. Two students go to university; one studies economics, the other psychology. Both students encounter the problem of scarcity but, as we’ve seen, the two disciplines point to very different responses to this problem (mindsets versus consumption). The notion of an abundance mindset need not call into question the assumptions underpinning economic theory (although it could do). But where it gets really tricky is when we add to this the empirical findings about people with another mindset that’s much more aligned to the caricature of a person that you might get from economic theory. Looking at this, Tim Kasser reviews studies of people who strongly orient towards values such as money and possessions. And revealingly, he finds that this group reports lower subjective well-being. In other words, even where our natural inclination is to try to satisfy our material desires, it’s unclear that this is the response that serves us best. Psychological approaches to scarcity, with some empirical grounding, therefore appear not just different to economic ones, but somewhat contradictory to them. This raises the question: is the way that scarcity is taught in economics too simplistic? The solution I suggest is that for students learning about scarcity, standard consumer theory (as taught to economics undergraduates) should only be part of the picture. We choose all sorts of things: among them, courses of action that help us to cultivate greater optimism, mindfulness, flow and so on; and of course we choose all the things we buy and consume. It makes sense, therefore, to couch consumer theory within a broader theory of choice: a framework that could contain both our consumption decisions and decisions that reflect a more psychological response to our desires. A unified approach to scarcity might help to resolve some of the contradictions currently apparent across different academic disciplines. It could also lead to richer, more realistic economic theories: if desires are not always treated as exogenous, for instance, then models might take into account the cases where consuming more is not necessarily the best “response” to the feeling of not having enough. It’s not that economics textbooks have it all wrong. But it does strike me that if the findings of all the social and behavioural sciences were brought to bear, we could approach “the economic problem” from a broader perspective that better fits the actual choices that humans face. This could have implications for economic theory, but also wider debates about what we mean by prosperity and how much is enough. Dan Nixon works in the Bank’s Stakeholder Communication & Strategy Division. It appears that you, and possibly much of economics, has some catching up to do on the state of research in this area. Search for “hedonic treadmill” and you’ll find a host of studies and a theoretical framework that largely supersedes what you’ve outlined here. More simply, if you ask people the question “how much is enough”, you’ll find a huuge number of people who answer “More than you!” This is of course the sin of greed and goes back into deep history, and in economics at least to Thorstein Veblen. It’s an interesting view, but how do we show its effect in macroeconomics? The anecdotal evidence of hoarding behaviours in times of stress is strong, and I do not doubt that the effects of a ‘scarcity mentality’ in behavioural economics are real; but how do tease out these effects in rigorous statistics? How do we make this into an effective policy tool? This is not an abstract question about quantifying hard-to-measure factors that economists are eager to dismiss as ‘subjective’ and discard from their models: it is a question about measurement and identifying interventions that are effective, ineffective, or dangerously counterproductive. Perhaps we never had it so good, and needed to be told; perhaps we have nothing to fear but fear itself; but I have my own fears about assurances that lack credibility, and exhortations that lead to stampedes in the opposite direction. And, if we’re going to be more subtle about it – the cumulative effect of better media and better education springs to mind – we had better be careful to observe and measure what we’re actually achieving, rather than the things we like to say.